1. Place the potatoes in a large pan, cover with water, bring to the boil and simmer for 10-12 minutes until tender. Drain very well and mash until smooth, then tip into a large bowl. 2. Meanwhile, place the salmon in a small frying pan and cover with boiling water. Simmer gently for 5 minutes until cooked through. Drain and discard the water, then break into large flakes, discarding the skin. 3. Preheat the oven to 200°C, gas mark 6. Stir together the mash, salad onions, horseradish and parsley. Fold in the flaked fish, then season. Shape the mixture into 8 even-sized cakes – the mixture will still be warm, so leave to cool a little if necessary. 4. Dust the cakes in flour. Place the egg and breadcrumbs in separate bowls. Dip each cake first in the egg and then in the breadcrumbs, making sure they are evenly coated. 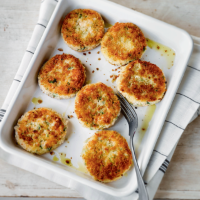 Transfer the fishcakes to a large non-stick baking sheet and spray lightly with oil. Bake for 20 minutes until crisp and golden brown. Serve with peas.